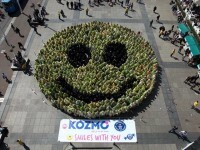 768 smiling people gathered today in the Croatia capital, Zagreb to set the Guinness World Record for the largest human smiley face. The previous record was 551 participants and are held by residents of Riga, Latvia. To set the record was officially confirmed certified judge from Guinness World Records, Tarika Vara.